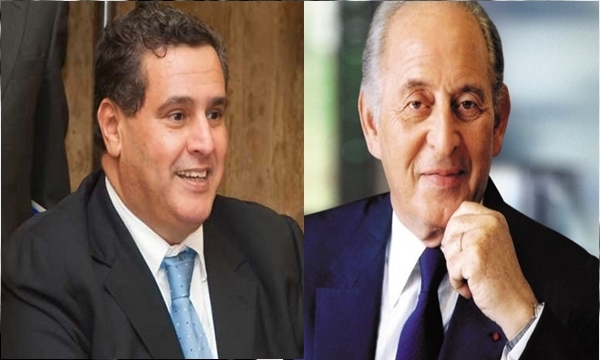 Rabat - Forbes named two Moroccan businessman - Othman Benjelloun and minister Aziz Akhannouch - the wealthiest people in the kingdom, awarding them the 19th and the 28th positions in a list ranking the worth of the wealthiest Arabs. Rabat – Forbes named two Moroccan businessman – Othman Benjelloun and minister Aziz Akhannouch – the wealthiest people in the kingdom, awarding them the 19th and the 28th positions in a list ranking the worth of the wealthiest Arabs. An analysis accompanying the rankings showed that the total net worth of Arabs listed on Forbes’ annual report decreased by 23.8 percent in just one year, presumably due to chronically low oil prices. The U.S.-based business news site said on Sunday that Benjelloun’s bank BMCE, which operates all over the world, including 20 African countries, is in the process of constructing a 30-story campus that will “loom” over Casablanca. The 83-year-old billionaire’s diversified business and investment profile, valued at just under two billion dollars, reaps profits from other industries as well; his holding company FinanceCom owns a majority stake in the insurance company RMA Watanya and a minority stake in Meditel, Morocco’s second-largest telecommunications company. In addition, the businessman runs a Paris-based investment firm called FinanceCom Asset Management, which he uses to fund businesses in Ghana, South Africa and other African countries. The firm’s list of sponsored entrepreneurs includes Mark Zuckerberg, the founder of Facebook. According to Forbes, Akhannouch, the Moroccan minister of agriculture and fisheries, holds a family fortune worth USD 1.3 billion through his majority ownership of Akwa Group, a conglomerate with investments in the petroleum, gas and chemicals companies Afriquia Gas and Maghreb Oxygene, both of which are publically traded. The minister, who also has interests in media, hotels and real estate development, does not take a salary from the Moroccan government for his services. The list included 32 Arab billionaires, none of whom was women. Some of the men on the list had the phrase “and family” attached to their names, which, in some instances, signified the wealth owned by the women related to them. In Akhannouch’s case, his wife Salwa Idrissi, runs shopping centers and owns the Moroccan franchises for Zara, GAP, and other global brands. Exactly half of the Arabs listed were from Gulf Cooperation Council countries, half of which were in the top ten. In total, six were citizens of Saudi Arabia, six from the United Arab Emirates, three from Oman and one from Qatar. Lebanon had the highest number of citizens on the list (seven), making it one of the countries with highest rate of billionaires per capita in the world. Yet, the net worth of Lebanon’s richest businessmen combined did not exceed USD 12.5 billion, which represents a third of the monetary value of the assets owned by the Saudi Arabians on the list (USD 34.6 billion). Egypt boasted six billionaires worth USD 14.2 billion. Prince Alwaleed Bin Talal Alsaud’s retained his crown as the wealthiest person on the list, with a net worth estimated at over USD 17 billion, encompassing investments in public and private companies in the United States, Europe, and the Middle East through the company Kingdom Holding Co. The 61-year-old prince also funds Middle Eastern film projects, hotels and other forms of real estate. Mohammed Alamoudi, notorious in Morocco for his company Corral Holdings’ mismanagement of the SAMIR oil refinery, followed right behind Alsaud with assets valued at USD 8.3 billion. Algerian businessman Issad Rebrab, the son of freedom fighters who lead the movement for independence from France, chimed in at 9th on the list, profiting from his privately-held food business conglomerate Cevital – the largest of its kind in his North African home country. Cevital owns one of the largest sugar refineries in the world, producing 1.5 million tonnes of raw product a year, in addition to vegetable oil and margarine. One of the company’s newest additions, French appliance maker Groupe Brandt, is set to open a USD 200 million plant in Algeria employing 7,500 people in a country afflicted with an unemployment rate approaching 10 percent and rising to 24 percent in the youth population.